Call it the curse of geography. 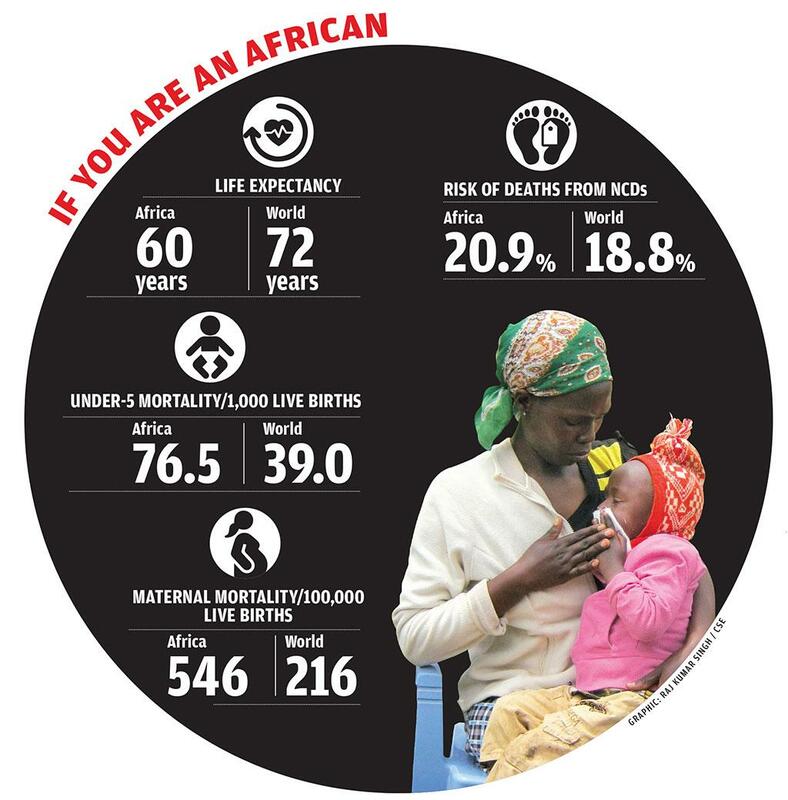 A person born in the African continent will live 17 years less than one born in America or Europe. Enduring life in a place that has the world’s highest infant and child mortality rates does not ensure that the spell of the curse will be broken. A 15-year-old adult in Africa has high probability of dying before the age of 60 years. The continent has a precarious demography—95 per cent of its population is less than 60 years old, while the average life expectancy at birth is 60. The continent has been living with recurring droughts and famines, and unending conflicts that have disrupted settled lives and crucial basic infrastructures. Their impacts on the overall health are now unfolding with scary manifestations. According to the Global Hunger Index 2018, Africa has the world’s 10 countries with the highest under-five mortality rate. Seven of them are fragile states, chronically ravaged by conflicts that do not allow governments to function. Chronic hunger makes a person highly vulnerable to diseases. An African is more prone to it than a person living in any other continent. An increase in the burden of disease has resulted in the demand for government medical support. But women and children are deprived of it, even in times of medical emergencies. African countries are not known for using funds on this crucial human development aspect. Significant amounts are diverted to fighting weather extremities and in relief efforts. Only nine countries spend US $500 per capita per year on health while half of the continent’s countries spend less than $140. This pushes the continent into a downward spiral. Africa has missed all the Millennium Development Goals. Now, it has the opportunity to meet the Sustainable Development Goals (SDGs) that are high on health-related targets. But Africa’s progress has been abysmal so far. The health indicators in African nations are so poor that meeting the world average seems unlikely. As if the burden of diseases that Africa is already known for were not enough, the continent is under the grip of the rich world’s diseases as well—non-communicable diseases. It immensely adds to the continent’s crumbling health infrastructure and stretches the already trickling health budgets. Soon, non communicable diseases will emerge as the bigger killer in the continent than the most common diseases causing deaths—HIV/AIDS. Climate change and environmental destruction could lead to the emergence of a variety of diseases that the world is unprepared to deal with. A strong health system could well be the saviour in the times to come. But Africa is still struggling with the basics. A badly managed continent means a degraded and polluted environment. Now, this too is taking several lives. In the African region recognised by WHO, all the children under five years of age are exposed to fine particulate matter (PM2.5), which is higher than the WHO air quality guidelines. Further, acute respiratory infection is the leading cause of death of children under five years of age in the African region. The economic cost of premature deaths from air pollution is estimated at $450 billion. The economic loss due to the lack of access to safe drinking water and sanitation is estimated to be 5 per cent of the region’s gross domestic product. According to WHO, every dollar invested in sanitation could yield over six-fold return. This was recognised in 2008 when 52 countries in the continent signed the Libreville Declaration on Health and the Environment for Africa. The Strategic Action Plan to Scale Up Health and Environment Interventions in Africa 2019-2029 was adopted at the closing of the Third Inter-ministerial Conference on Health and Environment held in the Gabon in November 2018. It showed that financial resources for these are limited. Lack of political will to improve infrastructure in the health sector has resulted in 80 per cent of the people taking help of traditional health workers for treatment. The African Union’s Abuja Declaration states that every country must invest at least 15 per cent of its annual budget into healthcare. In 2014, only four countries managed to achieve this. Health has been a matter of concern for Africa for many years. The Declaration of Alma-Ata, which hoped to achieve the goal of health for all, was signed way back in 1978 in Kazakhstan. There was barely any progress on this front, so the world met again this year in October at the same venue to renew the pledges. The Astana Declaration was signed. If Africa meets this, it would also meet the Universal Health Coverage target. The good news is that the continent has woken up to the importance of investing in improving the environment. It can take lessons from Rwanda which is moving towards meeting the SDG target. The country has strengthened its health network by making crucial investments and improving technology. This will help improve its health indicators. Achieving SDG targets is crucial to meet Africa’s Agenda 2063, which is a strategic framework for the socio-economic transformation of the continent. (This article was first published in the 1-15th December issue of Down To Earth under the headline 'Health in Africa'. It is part of a series on healthcare in Africa).